Michael Hargett, president of CVMR (USA), talks about the timetable for the company’s move to Oak Ridge. OAK RIDGE — The quality workforce here made the difference. So says Michael Hargett, explaining why a Canadian-born high-tech company is relocating its global headquarters to Oak Ridge. 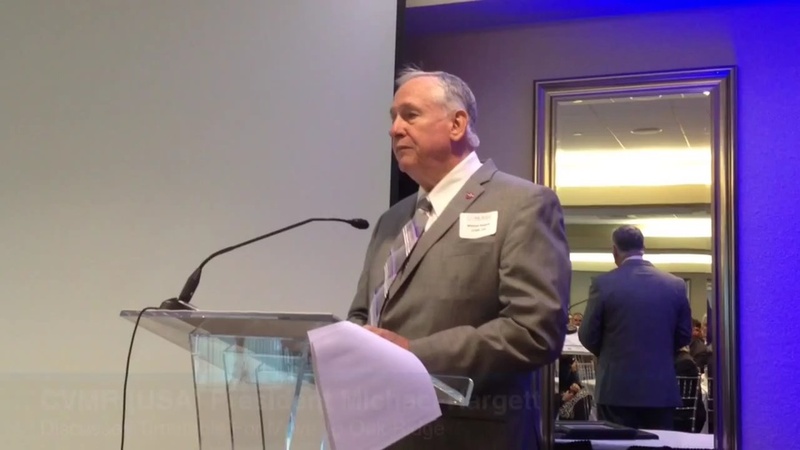 Hargett, president of CVMR (USA), was the featured speaker Thursday at the Oak Ridge Chamber of Commerce’s annual “One Voice-One Vision” luncheon, attended by some 200 members. Hargett said the company had narrowed its search for its new headquarters down to four locations in four states. “As we presented to our board of directors why Oak Ridge was the right choice, there’s no question we could get that superior workforce consistent with our needs,” he said. CVMR — an acronym for Chemical Vapour Metal Refining Inc. — is on a fast track, Hargett said, and will be moving from Toronto to Oak Ridge this year. The company, which makes a variety of materials from metal powders, intends to invest $313 million and hire 620 employees, moving fewer than 50 workers from its current headquarters. The day after the company announced its plans last Friday, job applications were in the company’s mailbox, Hargett said. A new website will go online April 1, and a new phone number will be published then, both venues where applicants can submit resumes, he added. CVMR, which has operations in 18 countries and subsidiaries in seven of those locations, has 43 patents on its processes for refining metal powders into a variety of uses. The intricate details seen on some U.S. currency bills are due in part to a very thin nickel coating made by CVMR that has been applied to U.S. Department of Treasury engraving plates to help preserve them, he said. Stents used to open clogged arteries are made from nonreactive, nonallergenic metal developed by CVMR, Hargett said, and some 15,000 of those stents will likely be made locally each year. Customers include major automotive firms, Los Alamos National Laboratory in New Mexico and General Dynamics, a U.S. Department of Defense contractor. Chamber of Commerce officials, in touting the organization’s goals, emphasized increased advocacy efforts, including recruitment of residents to serve in elected and appointed civic positions. The Chamber last year formed Progress PAC, a political action committee which was criticized by two members of City Council. All council and school board candidates endorsed by the new PAC were elected in November. In other matters, Steve Whitson, with H-S Whitson Construction Co., received the Kerry Trammell Volunteer of the Year Award, named for the late long-distance runner who was active in many civic organizations. 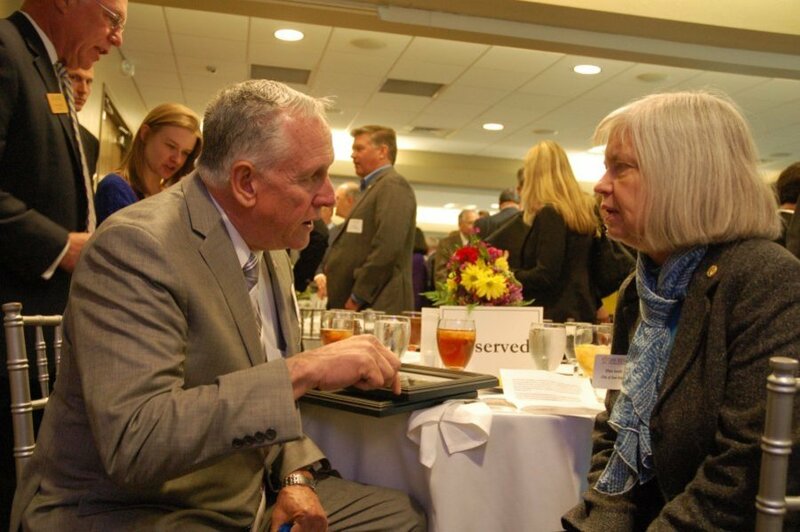 Former Oak Ridge Mayor David Bradshaw, with CapitalMark Bank & Trust, received the Eugene Joyce Lifetime Achievement Award, named in honor of the late attorney who played key roles in organizing many groups and institutions in Oak Ridge. 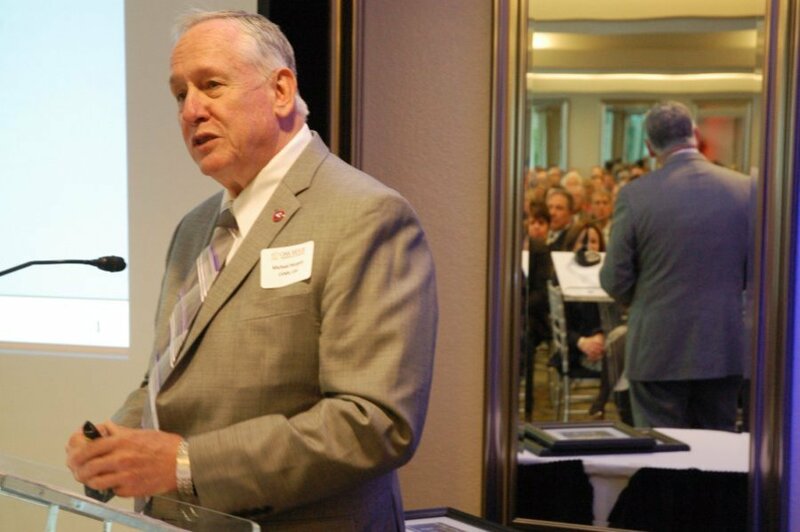 CVMR (USA) President Michael Hargett speaks Thursday to Oak Ridge Chamber of Commerce members about the Canadian firm’s relocation to Oak Ridge. Applications have already arrived at the company for some of the expected 620 new jobs.